GOSH Waterproof Volume Mascara - $15 - with a super-sculpting rubber brush that adds dramatic volume, length and definition without clumping or flaking, while the waterproof formula ensures a smudge-free look whatever the weather. Available exclusively at Shoppers Drug Mart and Pharmaprix stores across Canada. Love the small brush making it simple to get at all my lashes, even on the bottom and really love the fluttery false lash effect the formula offers! I don't normally bother with waterproof mascaras in the summer because my eyelids tend to be so oily then that they act as a built in makeup remover and mascara just smudges all over my face. But I do like a waterproof formula in the winter - between snow and watery eyes, it's the only thing keeping mascara on my lashes! I took this one for a test-drive (walk) on a snowy Saturday and I got home without a raccoon-eye in sight! And unlike other volumizing formulas, this one isn't at all clumpy - big win! Thanks for posting this, I'll have to try it... looks like a decent mascara! wow-and this is made by GOSH? 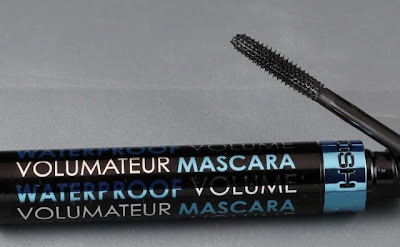 I am not a fan of the brand but this mascara makes a very obvious difference....I AM a fan of waterproof mascara especially during inclement weather. Okay, you've convinced me.